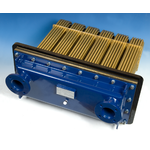 Blokland Non Ferro designs and produces box coolers and heat-exchangers. Almost 50 years of experience guaranties a reliable advice and excellent products. Apart from that Blokland Non Ferro has also propulsion- and rudder-systems in her program. The production is done in our modern utilized factory. Blokland Non Ferro is a Dutch based company and operates worldwide from its office and factory in the Netherlands.